Beekeeping - What You Need to Start Keeping Bees! In March and April you’ll be picking up your bees (hope you’ve got your bee order in, they’re going fast!). Below are some things to consider and plan for before you pick up your bees. A location in the open, preferably with a southern or easterly exposure, for maximum sunshine throughout the day. Away from animals and children, not along a foot path, or where there is direct traffic. Protected by a barrier (approx. 2 feet from - and facing a hill or wall) from wind, streets, etc. This will also force the bees to fly up and over cars, people, etc., thus causing them to be less of a nuisance and helping them to stay alive. Ease of access (you don’t want to be lifting heavy supers of honey up and down stairs or across rocky fields). A safe, natural habitat with a source for nectar and pollen. A typical honey bee colony forages more than 80,000 square yards to find plants and flowers with sufficient nectar (honey) the bees' source for energy and pollen (essential in brood rearing) the bees' source of carbohydrates. A nearby source of fresh water (within ¼ mile) so they don’t use the neighbor’s swimming pool. This can be a tank or barrel of water with rocks or floating boards or cork for the bees to land on. A safe, comfortable, home to live in. We suggest you buy a couple of good beekeeping books and read them all the way through, twice. Bee Suit - For the best protection, full bee suits are recommended. But whether or not a suit is used, a beekeeper's clothing should be white or light in color (bees generally do not like dark colors and will attack dark objects). Avoid woolen and knit material. You will want to wear clothing both that will protect you and you don’t mind getting stained (bees produce waste that shows up as yellowish marks on your clothing). You’ll want to close off all potential to getting stung by wearing high top boots or tucking your pants into your socks and securing your cuffs with rubber bands or duct tape. A note on protective clothing: There was a time when we could safely visit our bees wearing little protective clothing. With the arrival of Africanized honey bees into the Southern states, we've come to realize the potential danger of an aggressive hive and have learned to exercise caution when approaching our bees. A once gentle hive could be invaded and taken over by a small aggressive swarm in a few days. These bees are unpredictable and vigorously defend their hives. Protective clothing such as a bee suit, veil and gloves will help keep stings to a minimum in the bee yard if worn correctly. As beekeepers, it is our responsibility to help curtail the danger to our bees, ourselves, and others. At Bill's Bees, we practice responsible beekeeping for an urban environment. We primarily work with the Langstroth hive but you can also use the Top Bar Hive or the Warre Hive. We'll be happy to share our experience with these two styles of hives, as well. For many years, Bill's Bees held the Los Angeles County Beekeepers Association Beekeeping Class 101 at our apiary in Little Tujunga Canyon. The class grew from under 20 newbees in 2010 to nearly 200 in 2016. Since we no longer have our location in Little Tujunga Canyon, the Los Angeles County Beekeepers Association Beekeeping Class 101 is being held at The Valley Hive. You can fine information about the classes on the Los Angeles County Beekeepers Association Beekeeping Class 101 website and LACBA Facebook page. Reminder - Get your bees now. You don't want to be bee-less come bee season. Bill's Bees Sells Bees in Complete Hives - Medium Box Special, Deep Box, Packages, Nucs, and Italian Queens. Our bees have known gentle genetics and are great for commercial and backyard beekeeping. There’s very little in California’s agriculture industry that’s been left untouched by the ongoing drought, and bees are no exception. Besides making honey, bees are crucial to pollinating about one-third of all U.S. crops. But the drought, heading into a fourth year, is threatening honey production and the ability of beekeepers to make a living in a state that was once the top honey producer in the country. “My honey production is down about 20 percent from the drought,” said Bill Lewis, president of the California Beekeepers Association. Lewis, who manages around 50 billion bees in Southern California, explained that the lack of rain has reduced plants that provide food for the bees and the nectar they turn into honey. Lewis said he’s had to feed his bees much less nutritional food such as sugar water that’s threatening the health of the bees and slowing the generation of honey. Lewis added that feeding the bees this way costs him more but it’s a cost he can’t pass on to consumers. In 2003, California was the top honey producer in the U.S., but it has since fallen behind North Dakota, Montana, South Dakota and Florida. And according to the Department of Agriculture, California’s honey crop fell from 27.5 million pounds in 2010 to about 10.9 million pounds in 2013, or less than 5 percent of the country’s yearly $317 million crop. But beyond honey production is bees’ crucial role in the pollination of numerous crops, like plums, strawberries, melons, lemons, broccoli and almonds. Pollination also is a revenue source for beekeepers, but a lack of irrigation water has left many fields empty. An estimated 420,000 acres of farmland went unplanted this year—about 5 percent of the total in the state. That means that fewer farmers are renting hives and beekeepers have less income. “I’ve had to raise my prices to farmers who do rent, which hasn’t been easy,” said the California Beekeepers Association’s Lewis. As bad as the situation in California is—80 percent of the state is in extreme or exceptional drought—the Almond Board’s Curtis said the lack of rainfall has not prevented almond growers from getting sufficient bee pollination so far. But the drought is just one hazard making honeybees suffer. Beehive losses worldwide have increased over the years due to pesticides, parasites and colony collapse disorder, by which adult bees disappear from colonies due to various causes. However, for Lewis, the drought is enough of a crisis to make a plea for help, even if it means using more water. For those of you who have not already set aside the week of Nov. 17-21, 2014 to attend the CSBA Annual Convention, please do so today! This year's 125th Annual Convention will be hosted by the Hyatt in Valencia, CA just north of Los Angeles with easy access to the I-5 freeway and very close to the Magic Mountain Theme Park and more for those familiar with the area. Please see the full-page ad at the bottom of this issue! We are expecting a large turn-out of attendees from all over CA and around the country. There should be plenty of interest to both those making their living keeping bees as well as a large contingent of urban beekeepers, especially from the over 1,000 members of bee associations in Los Angeles and vicinity. I encourage all attendees to spend the extra dollars to stay at the Hyatt. Avoid the hassle of the morning commute; share a room to get the cost down. I am interested in booking as many rooms as possible since our group earns 1 complimentary room for every 50 rooms booked. These complimentary rooms are used to house some of our speakers, which saves the CSBA the cost of these rooms. We are bringing in many speakers that will need these rooms so please book your room today! Convention information is being added daily to the CSBA website so check back often to get the latest updates on the program. There will be links to most of our speaker biographies. Our September 4th CSBA board meeting is fast approaching. I encourage any CSBA member to attend these board meetings and get involved in supporting your organization. The CSBA Board of Directors is a core group of individuals that give up time out of their busy daily schedules to make the decisions that will better the beekeeping industry in CA. New blood is always welcome and encouraged. It is most important to share the burden in advancing the interests of CA beekeepers and beyond. Work is being done to make almond orchards a safer place for bees. Your Board of Directors is working hard to communicate with almond growers and Pest Control Advisors (PCA's) to mitigate bee health problems that occurred last season during almond pollination and to avoid the same problems this coming pollination season. There will be a panel at the CSBA convention with representatives from the almond Industry, PCA's, and beekeepers affected by bee kills last year in almonds. 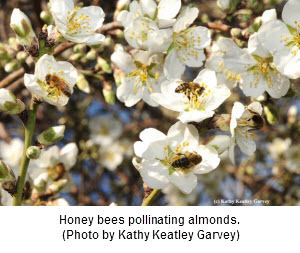 The goal - finding a safer path for bees in almond pollination in 2015. There are important meetings to attend to. Your CSBA President is planning to attend a follow-up meeting to the high level meeting held in Washington D.C. last March that resulted in a memorandum from President Obama in support of Honey Bee Health and Forage support systems. This USDA Forage and Nutrition Summit will also be in Washington D.C. in October. I believe Day 1 of the summit is open to the public. Day 2 will focus on working groups and will be limited to invited participants. This meeting will be followed by the 14th Annual North American Pollinator Protection Campaign (NAPPC) Conference. I expect a number of attendees at both these meetings will be in attendance at our CSBA Convention in November. I hope to get those attendees to regurgitate information gleaned from these meetings. I have heard news of good honey harvests in the Dakotas and the Mid-West. I hope this translates to lots of $ being spent on auction items at the CSBA Convention in support of raising $ for bee research. Bill Lewis of Bill's Bees will be 'talking about bees' on the Hallmark Channel's Home & Family Show Tuesday, July 15, 2014 at 10am9c. The show will be replayed Wednesday, July 16, 2014 at noon. President of the California Beekeepers Association Bill Lewis is buzzing about town today with information on how to save honey bees and why we as humans are so dependent on them for our food supply. The bees not only pollinate the plant-based foods we eat, but also pollinate the foods animals eat, which in turn provides us with meat, dairy, and more. It's all about preserving the food chain. Learn more about how parasites, drought, and pesticides impact the bee population and how we can help by planting flowers. Plus, find out how to raise a honey bee colony in your very own backyard. There has been a whirlwind of activity since my last report in February. CSBA contributed funds to send the "Bee Girl" Sarah Red-Laird (an awesome ambassador for bees) and myself to participate with a display and 5 bee activity tables at Pheasant Fest in Milwaukee, WI. It was an excellent opportunity to collaborate with the Pheasants Forever group and Pete Berthelson on promoting forage for bees and other wildlife. All of the postcards colored by youth and mailed to US Secretary of Ag, Tom Vilsack, must have influenced the decision to spend $3M to encourage Midwest farmers' conservation efforts and plantings for bee forage. ABF American Honey Queen Executive Director Anna Kettlewell was instrumental in recruiting the WI Honey Producers Association including President Derald Kettlewell, past President Tim Fulton, the current WI Honey Queen and past Honey Princess and a plethora of other volunteers to staff the activity tables. I had the opportunity to meet with legislators at the Farm Bureau-hosted legislative reception and work with Platinum Advisors representative Holly Fraumeni on Assembly Bill 2185 introduced by Assembly member Susan Eggman that will hopefully encourage public land owners to consider honey bees in future land use plans. Ag Day at the Capital was another opportunity to connect with legislators and a photo op with CA Secretary of Ag, Karen Ross, an active supporter of bees. Much appreciation goes to Carlen Jupe for coordinating and in the staffing of our booth by Eric Mussen, Kathy Keatley Garvey, Bill Cervenka and the Sacramento Area Beekeepers Association's Marti Ikehara, and of course, Haagen-Dazs for donating the ice cream. Read Kathy's entire blog here. Almond pollination has come and gone. There were strange dynamics in almonds. The shortage of water resulted in some growers making the decision to pull out older trees reducing the need for bees. There were enough colonies to go around and there was perfect pollination weather again during bloom. I think almond growers can expect another close to record harvest. Unfortunately, some beekeepers, including myself, got sucker punched and lost large numbers of bees to what we are still uncertain. 50% of our colonies were affected. They all went into almonds at about equal strength with low mite loads. Towards the end of bloom, we experienced massive amounts of dead bees around the hives and it continued for several weeks after the bees were moved on to avocado orchards. I have always felt pretty safe in almonds but when an 8-10 framer that we expect to double in strength goes backwards to a 6, something is wrong. There were reports that a few growers may have been tank-mixing fungicide with insect growth regulators (IGRs) for a "free ride" to save labor cost. There were also reports that pesticides were being sprayed on alfalfa fields to control weevils within flying distance. Could the impact on bees have been avoided by releasing bees 7-10 days sooner without much impact on almond production? Some beekeepers may opt to stay home next season without some kind of guarantees that this will not happen again. Whatever is going on is making the costs to beekeepers skyrocket and this cost has to somehow be recouped. Subsequent meetings with EPA representatives gave no indication that labeling language on fungicides and IGR labels or other chemicals including adjuvants would be changed to make them more protective of bees any time soon or even before the 2015 almond bloom. CDFA was concerned enough to devote a whole day of their board's time to listen to beekeeper concerns in early April. Beekeepers gave some excellent presentations that focused on the need for more clean forage, the need for more help to defeat our # 1 pest - Varroa, and help to improve pesticide labeling to be more protective of bees. The Almond Board of CA is equally concerned and hopefully can convince more growers to give bees a break and delay the spraying of anything in the future until after the bees are gone. A meeting has been scheduled with CDPR later this month to address this situation as well. Hopefully, something positive comes out of all of this. I really hope everybody gets a decent honey crop out of the oranges! The bees weren't all that buzzed at the 2014 California Agriculture Day, celebrated today (March 19) on the west lawn of the California State Capitol. The California State Beekeepers' Association (CSBA) and theSacramento Area Beekeepers' Association (SABA) staffed a beekeeping booth from 10 a.m. to 2 p.m. and filled it with honey straws,Häagen-Dazs premier ice cream and bee-related pamphlets from Project Apis m. A bee observation hive, brought by Bill Cervenka Apiaries of Half Moon Bay, fronted the booth. The bees buzzed all right, but the people--the general public lining for the ice cream donated by Häagen-Dazs--seemed to create the biggest buzz. They made a literal beeline for the strawberry and vanilla ice cream. Häagen-Dazs supports the University of California, Davis, through its bee garden and bee research (some 50 percent of its flavors require the pollination of bees). By 11:35, the honey was all gone. "It vanished, just like our bees," quipped Bill Lewis, CSBA president. Staffing the booth with him were Carlen Jupe, CSBA treasurer; Marti Ikehara of SABA, and Extension apiculturist Eric Mussen of the UC Davis Department of Entomology and Nematology. 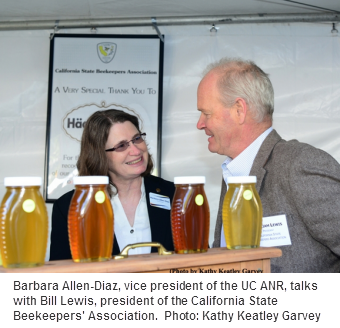 Among those stopping to chat with the beekeepers were California Secretary of Agriculture Karen Ross and Barbara Allen-Diaz, vice president of the UC Agriculture and Natural Resources (UC ANR). The California Department of Food and Agriculture sponsors the annual event, this year focusing on "Celebration, Innovation and Education." Bill Lewis, who makes his home at Lake View Terrace in the San Fernando Valley, maintains 650 colonies of bees with his wife, Liane, and business partner Clyde Steese. Their company, "Bill's Bees," offers pollination services, honey, pollen, beeswax, candles and handmade soap. Their bees pollinate almonds, oranges, avocados and alfalfa. For Lewis, his interest in bees began at age 14 when he took up beekeeping in the Boy Scout program and earned his beekeeping badge. That was in Wisconsin, north of Milwaukee, where he maintained several bee hives in his backyard. "I 'abandoned' them when I went off to college," he said. After earning his master's degree in mechanical engineering at Purdue University, he settled in California to work in the aerospace industry. Ten years later he began a 10-year period of working at a horse-boarding stable. "Horses don't much like bees," he commented. "It bothers the horses when they have to share the same water bowl." How did he get back into beekeeping? "The bees found me," Lewis said. He began keeping bees in 1991, first as a hobby, and then as a business. "I'm a first-generation beekeeper." "Our food supply is so dependent on bees," Lewis said. As visitors flowed by, some asked him what they could do to help the bees. Plant bee friendly flowers, buy local honey, try not to use pesticides in your garden, and generally, provide a friendly place for bees. His favorite variety of honey is black sage "but we're not getting to get much of it this year due to the lack of rain." His second favorite: orange blossom. He also has almond honey, which he and Mussen describe as "bitter." And, Lewis said, it gets more bitter with time."